Exploring new lands, making new scientific discoveries, questioning long-held religious doctrines – even getting rid of the odd king or two – all of these things were part of Britain’s story between the 16th and 19th centuries. Creative energy, though, was certainly not unique to Britain; there was so much of it bouncing about Europe at this time, challenging the established order and pioneering social reform, that historians have given it a nice label – ‘The Enlightenment’ – or perhaps more accurately, ‘The Age of Reason’. People like labels. Man has progressively challenged physical and intellectual boundaries, but there is no escaping the explosion of thinking that occurred in Europe in the wake of the Reformation and at the end of the Renaissance. Perhaps it was merely a natural continuation, part of Man’s evolution, taking place in parallel with an expanding knowledge of the world, an increase in international trade, groundbreaking scientific advances and the industrial revolution. The Enlightenment is characterised by liberalism, tolerance and scientific questioning as well as opposition to absolutism and religious dogma. 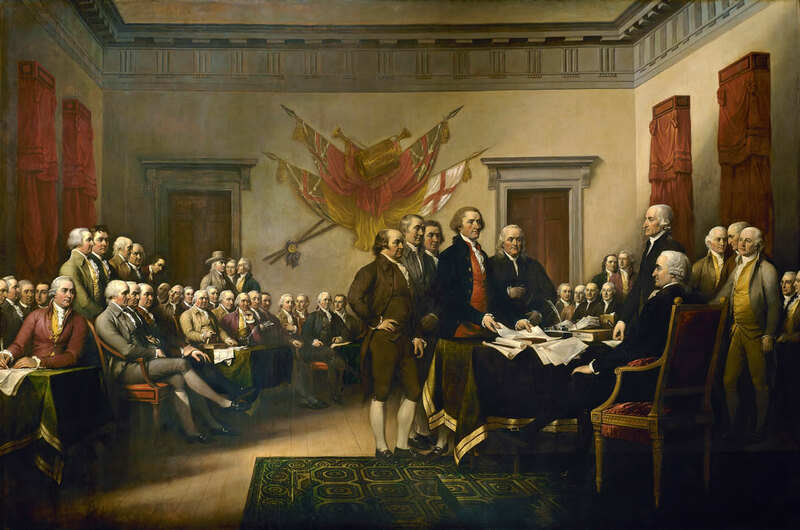 Its principles helped inform the American and French revolutions, as well as paving the way for modern western societies. The period of the Enlightenment spanned the 17th to the early 19th centuries, depending (I guess) on personal bias – and it means slightly different things in different countries. 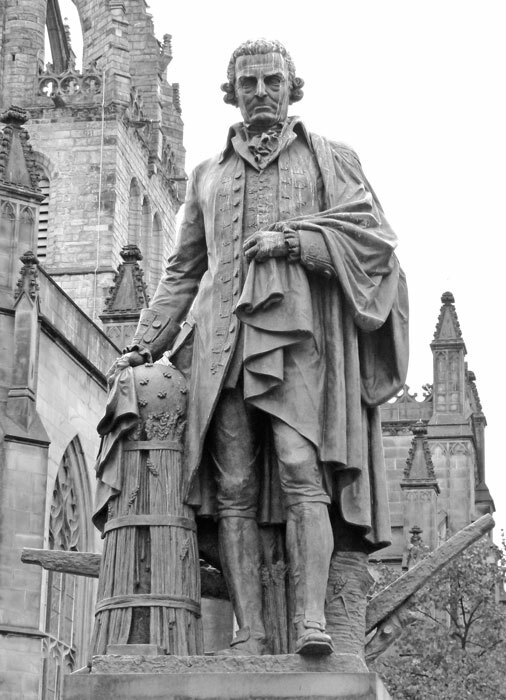 Scotland had its very own enlightenment, due to the particular achievements of Scottish philosophers and scientists in the 18th century, but a central and crucial feature of the Age of Reason is its international nature. Was this the first time in history that there was not only an outpouring of intellectual thought, but also the means and the will for this to be communicated between nations so effectively? Ideas only make a difference if they are spread. Critical to the spread of ideas, of course, was the growth of literacy. Once upon a time, the ability to read and write was limited to a very few, most of them clergymen. With the invention and spread of printing came the ability to produce a range of material and, moreover, material in the local language. One consequence of the Reformation in Britain was the production of the Bible in English; so now people could read the Word of God for themselves – an incentive to become literate. Without printing and the growth of literacy there would have been no Enlightenment. Mentioning just a select few of the luminaries associated with this spontaneous movement, we have: the Englishman John Locke (1632-1704), sometimes known as ‘the father of liberalism’ and whose words influenced Thomas Jefferson when writing the Declaration of Independence; the genius of Isaac Newton (1642-1726), another Englishman, who published his ‘Philosophiæ Naturalis Principia Mathematica’ in 1687 and whose laws of motion and gravity underpin so much of modern physics; the Saxon Gottfried Leibniz (1646-1716), who invented binary arithmetic; the hugely influential and multi-talented Frenchman, Voltaire (1694-1778), another influence on the fledgling United States, promoter of freedom and the separation of church and state; David Hume (1711-76), Scottish philosopher, economist and historian; Jean-Jacques Rousseau (1712-78) in Geneva, whose views were so admired by French revolutionaries and who espoused the importance of education; Adam Smith (1723-90), another Scot, whose ‘Inquiry into the nature and causes of the Wealth of Nations’, published in 1776, defined capitalism and has earned him the title ‘father of economics’; the Prussian Immanuel Kant (1724-1804), champion of universal peace and international cooperation; Edmund Burke (1729-97), an Irish/British statesman who supported American independence and Catholic emancipation; Thomas Paine (1737-1809), inspirational political thinker from Norfolk, who was convicted of seditious libel in Britain. 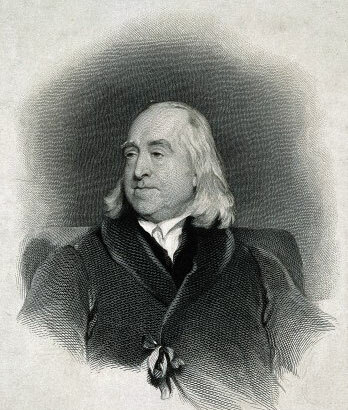 And not forgetting dear old Jeremy Bentham (1748-1832), the London-born philosopher and reformer quoted in this chapter’s title, and who asked for his body to be put on display at University College London after his death.